FSSA Film teacher Mr. Spagnuoli brings meditation into the classroom. The media lab located on the first floor of Frank Sinatra School of the Arts (FSSA), is home to the film students of the school. The media lab is a creative space that utilizes tables instead of desks, giving students an unusual layout to refresh their minds, but lately there’s a new activity refreshing the minds of these young artists. Film teacher, Mr. Spagnuoli, has implemented a daily routine with his students to promote creative thinking and relieve stress. From personal experience, Mr. Spagnuoli has benefited from meditation and has recently shared his stress reliever secret with his students. “It works wonders for my mental clarity, serenity, and just overall reduction of stress and anxiety. I was working amongst students last year during class, and I just felt this tension. A disease. It’s the hustle and bustle of a school day,” said Mr. Spagnuoli. The routine starts with students filing into the classroom and sitting at their usual tables while Mr. Spagnuoli instructs them to place their feet on the floor, sit with their backs against the chair, and hands on their lap. Then students are welcome to close their eyes and begin clearing their minds of all distractions and worries they might have. Students are given three minutes of silence to forget all the problems they encountered so far and any upcoming problems they think they might encounter throughout their day. Once the three minutes is up, a relaxing wind chime alarm from Mr. Spagnuoli’s timer on his phone wakes the students from their meditation. Mr. Spagnuoli believes meditation aims to quiet the mind, allow us to really become one with our breathing, be more mindful because we’re always running from one thing to the next, and focus on what’s really important. “Most of us bring so much mental noise to the table, whether it’s preconceived notions, a bad morning commute, or worries we’re carrying around that really have no weight. Meditation helps filter in the good, and filter out the bad, in my opinion,” he said. Although meditation works for Mr. Spagnuoli, not all students are pleased by this new routine. “I understand the reason why we meditate, but I think it wastes time we could be using to get more work done,” said senior film major Grace Karambasis. 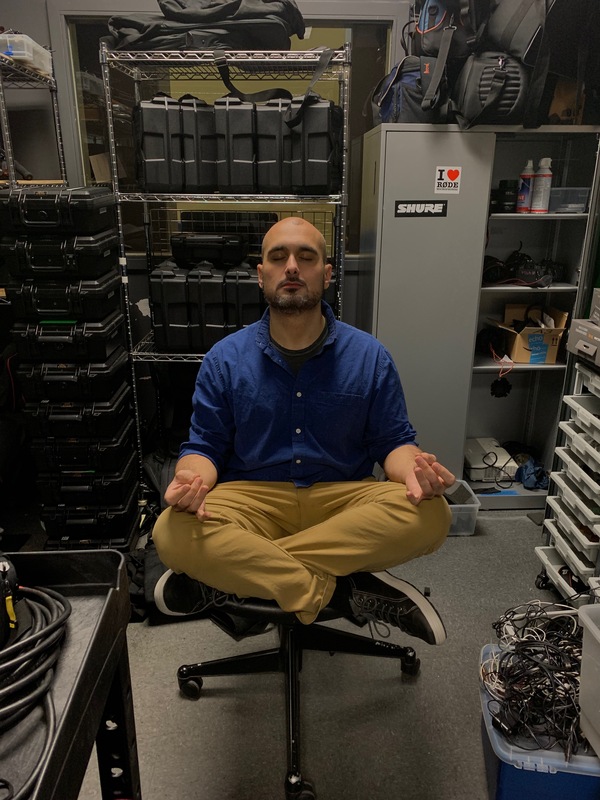 Other students, like senior film major Joseph Rana, appreciate meditation as a good way to calm down after a long, stressful commute to school. Whether students are participating because they genuinely need to meditate or because it’s a part of the class, the senior film majors have a deep respect for this activity and appreciate Mr. Spagnuoli’s attempt to help better his student’s mental state with all the stress of college applications burdening them. ← Have Phones Replaced Toys?